Sunlight or white light comprises all the colors of the visible spectrum: red, orange, yellow, green, blue, indigo, and violet. These colors travel at different wavelengths, decreasing in length from red (the longest) to violet (the shortest). When sunlight enters the atmosphere, materials present there break up sunlight into its component colors through reflection (bouncing off an object), refraction (bending through an object), or diffraction (bending around the edge of an object). Rainbows are among the most remarkable effects in the atmosphere. When sunlight enters a raindrop, it is refracted or bent. Since the colors of the spectrum are all bent at different angles, this refraction causes the colors to disperse or separate, as in a prism. The full spectrum of colors is then reflected (bounced) off the back of the raindrop into the air. As the colors pass out of the raindrop into the air, they are refracted a second time. This second refraction causes the different bands of colors to become more distinct. A rainbow is produced as the net result of this sequence of events repeated over and over when the atmosphere is filled with billions of tiny raindrops (such as after a storm). Diffraction: The bending of light or another form of electromagnetic radiation as it passes through a tiny hole or around a sharp edge. Dispersion: The separation of light into its separate colors. Reflection: The bouncing of light rays in a regular pattern off the surface of an object. Refraction: The bending of light rays as they pass at an angle from one transparent or clear medium into a second one of different density. Scattering: The bending of light rays as they bounce off very small objects. Spectrum: The band of colors that is formed when white light passes through a prism or is broken apart by some other means. Mirages are one of the most familiar optical effects produced by refraction. Mirages occur when light passes through air layers of different temperatures. One type of mirage—the inferior mirage—forms when a layer of air close to the ground is heated more strongly than the air immediately above it. Light rays passing through the two layers are refracted. As a result, light from the sky appears just below the horizon, like a body of shimmering water. Nearby objects such as trees appear to be reflected in that water. A second type of mirage—the superior mirage—forms when a layer of air next to the ground is much cooler than the air above it. In this situation, light rays from an object are refracted in such a way that an object on the ground appears to be suspended in air above its true position. Auroras are one of nature's most stunning displays, appearing as luminous streamers, arcs, curtains, or shells in the night sky. Those that occur in the Northern Hemisphere are known as aurora borealis or northern lights; those in the Southern Hemisphere are known as aurora australis or southern lights. lower levels in the atmosphere glow yellow-green. Those at higher levels glow red. Nitrogen molecules glow blue. As a rule, stars twinkle, but planets do not. Stars are so far away that their light reaches Earth as a single point of light. As that very narrow beam of light passes through Earth's atmosphere, it is refracted and scattered by molecules and larger particles of matter. To an observer on the ground, the star's light appears to twinkle, or blink on and off many times per second. Most of the gas molecules that compose the atmosphere are oxygen and nitrogen. When sunlight strikes these molecules, the longer wavelengths of that light pass right through, but the shorter wavelengths (violet, indigo, blue, and green) are reflected. When we look at the sky, we only see these scattered bands, which combine to appear as varying shades of blue. In the moment following sunset or sunrise, a flash of green light lasting no more than a second can sometimes be seen on the horizon on the upper part of the Sun. This green flash is the very last remnant of sunlight refracted by Earth's atmosphere, after all red, orange, and yellow rays have disappeared. The green light remains at this moment because the light rays of shorter wavelength—blue and violet—have been scattered by the atmosphere. Green flashes occur very rarely. 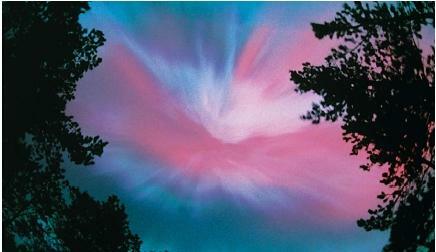 The passage of sunlight through cirrus clouds can produce optical effects such as haloes and sun dogs. Cirrus clouds, which occur above 16,500 feet (5,000 meters), are made up of millions of ice crystals. Each tiny ice crystal acts like a glass prism, refracting sunlight most commonly at an angle of 22 degrees. Sunlight refracted in this way forms a circle of light—a halo—around the Sun (refracted moonlight forms a halo around the Moon). When relatively large ice crystals are oriented horizontally in a cirrus cloud, the refraction pattern they form is not a circle, but a reflected image of the Sun. Known as sun dogs, these reflected images are located at a distance of 22 degrees from the actual Sun, often at or just above the horizon. Sun dogs are also known as mock suns or parhelia. A corona is a bright disk of light that appears around the Moon or the Sun. It forms when moonlight or sunlight passes through a thin cloud layer filled with water droplets. When the light passes by the edges of the droplets, it is diffracted or bent. This diffraction causes the "white" light to break up into its component colors. Blue light (shortest wavelength) is bent the most, forming the inner ring of the disk. Red light (longest wavelength) forms the outer ring. The disk may be fairly sharp and crisp, or it can be diffuse and hazy. Coronas around the Sun are more difficult to observe because of the Sun's brightness.